Sydney is known for nightlife, trails, beaches, parks, and museums. 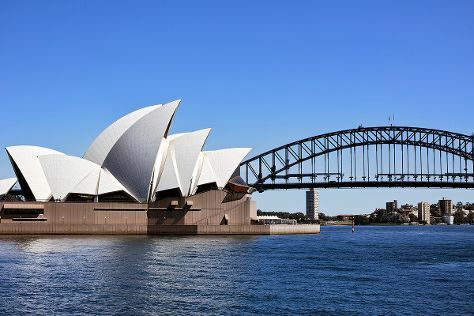 Your plan includes some of its best attractions: make a trip to Sydney Opera House, stroll through Coogee Beach, admire nature's wide array of creatures at Sea Life Sydney Aquarium, and wander the streets of Darling Harbour. For photos, other places to visit, and tourist information, read our Sydney day trip planner. Mumbai, India to Sydney is an approximately 17.5-hour flight. The time zone changes from India Standard Time (IST) to Australian Eastern Standard Time (New South Wales) (AEST), which is usually a 4 hour difference. Traveling from Mumbai in November, things will get a bit cooler in Sydney: highs are around 29°C and lows about 19°C. Wrap up your sightseeing on the 28th (Wed) early enough to travel to Port Douglas. Kick off your visit on the 29th (Thu): see some colorful creatures with a scuba or snorkeling tour. To see other places to visit, maps, ratings, and tourist information, read Port Douglas online tour itinerary builder . Traveling by combination of flight and shuttle from Sydney to Port Douglas takes 7 hours. Alternatively, you can drive; or do a combination of train and bus. In November, Port Douglas is a bit warmer than Sydney - with highs of 36°C and lows of 26°C. Cap off your sightseeing on the 29th (Thu) early enough to go by car to Cairns. On the 30th (Fri), take a tour by water with Boat Tours & Water Sports. To see photos, where to stay, traveler tips, and more tourist information, use the Cairns driving holiday planner. Getting from Port Douglas to Cairns by car takes about 1.5 hours. Other options: take a bus; or take a shuttle. November in Cairns sees daily highs of 36°C and lows of 26°C at night. Wrap up your sightseeing by early afternoon on the 1st (Sat) to allow time for travel back home.